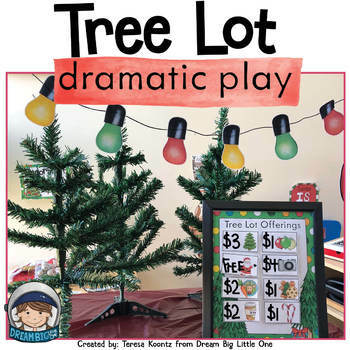 This fun tree lot themed dramatic play center encourages students to play imaginary roles of going to a Christmas tree lot where they can pick a tree, decorate it, buy and sell hot chocolate and cookies, visit with Santa and feed his reindeer. 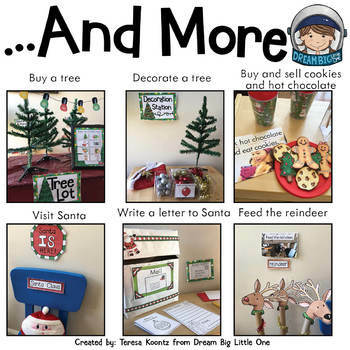 There is also some directions and printables to make a mail box and write Christmas letters to friends, family and of course, Santa all while practicing math, literacy, self-regulation, fine/gross motor skills, and social skills. 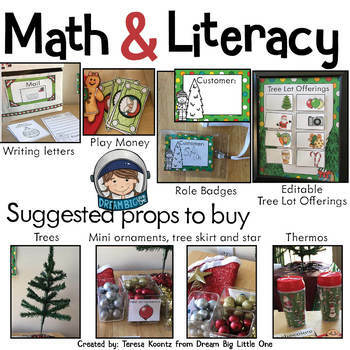 There are simple instructions to show you how to make some of the props using common classroom/home materials but you will need to buy miniature trees and ornaments. You can find them at the Dollar Tree for $1 and at Target's Dollar Spot for $3. Here are some other common tools you may need: a laminator, lanyards, clipboards, dry erase markers, etc. 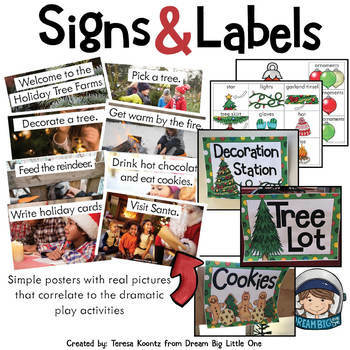 Actual photos of dramatic play activities - can be used to make into a book or for posters. Get the inside scoop on all store discounts, free products and product launches. Just click the green “Follow Me” star, next to my logo.